I arrived home last week from the annual meeting of the Society of Biblical Literature to find a package in my mailbox. 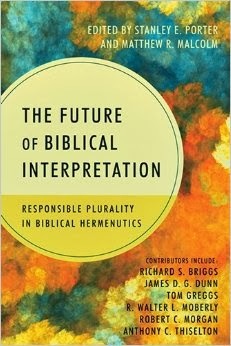 The kind folks at InterVarsity Press sent me a gratis copy of the recently released The Future of Biblical Interpretation: Responsible Plurality in Biblical Hermeneutics edited by Stanley M. Porter and Matthew R. Malcom. It looks to be quite an interesting volume featuring eight chapters looking at Biblical hermeneutics with related topics like Theological Responsibility, Historical Responsibility and Ecclesial Responsibility, to name a few. Article authors include well-known scholars like Thiselton, Moberly, Dunn, and Porter. The Bible encompasses a plurality of voices, not only in genre but in perspective. And not surprisingly, interpreters of the Bible have generated a plurality of interpretations. How might biblical scholars work responsibly with and within this plurality? And what are the future directions or possibilities for biblical hermeneutics? The essays in The Future of Biblical Interpretation originated in a conference held in honor of Anthony C. Thiselton, who is well known for his important work in hermeneutics and New Testament interpretation. After an opening essay by Thiselton on “The Future of Biblical Interpretation and Responsible Plurality in Hermeneutics,” the contributors look at the issues from a variety of angles—theological, scriptural, kerygmatic, historical, critical, ecclesial and relational. The result is an engaging conversation exploring responsible and productive interpretation of the Bible. A must-read for anyone seriously engaged in biblical scholarship today. I look forward to reading this book and posting on it in the future. Many thanks to folks at InterVaristy Press! I have posted this in the past, but it seemed like a good time of the year to remind everyone about it. I can't tell you how many times I have heard people complain about Xmas - "Don't take Christ out of Christmas!" In reality, that is not what is happening. Xmas is what is known as a Nomina Sacra, an ancient way of shortening the name of Christ out of respect. Christ is in the "X," the Greek letter Chi, which is the first letter used to spell "Christ" in Greek. It is an abbreviation, one used quite often by early Christians. Another example is to the right. 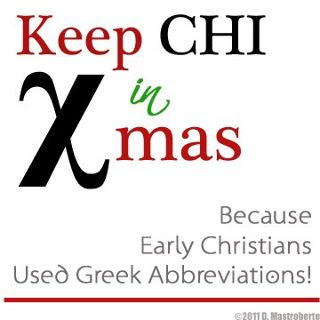 The early church used the first two Greek letters in the word Christ, chi (C) and rho ( R), a symbol that later became part of the official standard of the emperor Constantine. So the next time you see Xmas in a store don't tell them "hey, put Christ back in Christmas." Instead you might thank them for partaking in an ancient Christian tradition of referring to Christ with a Greek letter. I doubt many will know what you are talking about.